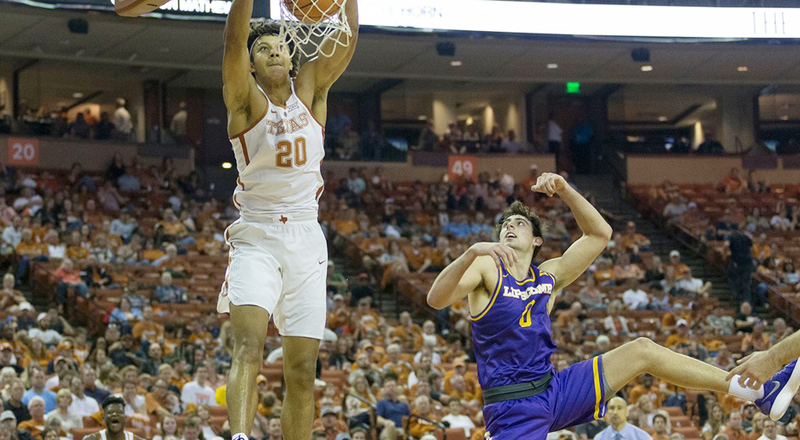 Forward Jericho Sims and the Texas men's basketball team finished off Lipscomb, 81-66, to win the second NIT championship in program history (photo courtesy of texassports.com). NEW YORK, N.Y. — Texas men’s basketball head coach Shaka Smart had made no secret of the fact that the Longhorns were not just happy to be in the National Invitational Tournament (NIT), to walk away with the college equivalent of a participation ribbon. Instead, he said, the Longhorns intended to try to do everything to win the whole thing. Smart made believers of his players, who in turn made their coach look like a fortune teller, riding forward Dylan Osetkowski’s double-double and guard Kerwin Roach’s 16 points to an 81-66 win over Lipscomb to win the NIT championship before an announced crowd of 4,051 in New York’s Madison Square Garden. The Longhorns finish the season with a record of 21-16; their NIT championship was the second NIT title in program history (UT also won in 1978). Texas improved to 11-3 all-time in five NIT appearances, and picked up its fourth victory in as many NIT games at Madison Square Garden. Texas remained perfect against Lipscomb, picking up its third victory in as many games against the Bison. Osetkowski scored a game-high 19 points and pulled down 11 rebounds, while Roach supplemented his scoring output with a career-high nine assists. Osetkowski’s double-double, in his final college game, was his sixth of the season. He hit half of his 10 field goals, and shot 3-of-6 from three-point range. Roach also shot 50 percent from the floor, draining half of his 12 field goal attempts in what also was the last game of his career. Sophomore guards Jase Febres and Matt Coleman scored 17 and 11 points, respectively. The Longhorns’ performance went far beyond a list of the game’s top scorers. The UT offense also generated a season-high 23 assists — the previous standard for the season was the 22 helpers dished out Dec. 15 in a 98-60 thrashing of Grand Canyon University. Texas also continued its stretch of outstanding postseason defense: in five NIT games this season, the Longhorns were particularly stingy at the three-point line, holding five opponents to 27.6 percent shooting from long range. UT, meanwhile, shot .351 from behind the arc, burying 13 of 31 three-point shots against the Bison. Roach’s 16 points gave him 1,411 in his career, lifting him past former UT center Chris Mihm into 16th place on the program’s all-time scoring list. Febres, meanwhile, wrapped up the season with 89 three-pointers, the ninth-highest total in Texas men’s basketball history.